Télévision Nationale d'Haiti Presents "JAZZ FOR PEACE™"
"Separating the Wheat From the Chaff - Télévision Nationale d'Haiti Presents JAZZ FOR PEACE™" TV Special previews Historic Concert in Haiti on 11th Anniversary of their Landmark United Nations Event! 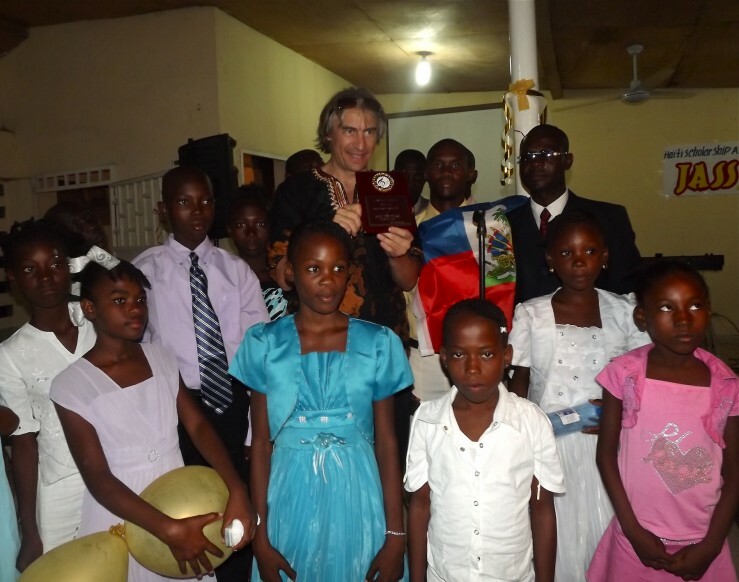 Rick DellaRatta awarded in Haiti by children of Haiti Scholarship Assn. Jazz for Peace founder Rick DellaRatta is interviewed in this outstanding feature by Télévision Nationale d'Haiti which previewed their recent Landmark concert in Port-au-Prince for Haiti Scholarship Association. Here is an excerpt from "Separating the Wheat From the Chaff - Télévision Nationale d'Haiti Presents JAZZ FOR PEACE™"
This revealing interview took place on Sept. 25, 2013 - exactly 11 years after their now Historic Concert at the United Nations which united Israeli, Palestinian, and Americans and launched this acclaimed benefit concert series. Haiti Scholarship is a non-profit Association which is working to help the poor people living in the extreme poverty to change their living condition through education, health, and development. International Dove Aid receives Grant from Jazz for Peace™! Jazz for Peace™ feat. Rick DellaRatta to perform Historic Event in Pakistan! Rick DellaRatta and Jazz for Peace™ return to Baltimore on December 19th for Bella's Blessings! Three Outstanding Acts Featured at the first Jazz for Peace™ Concert in Finland!